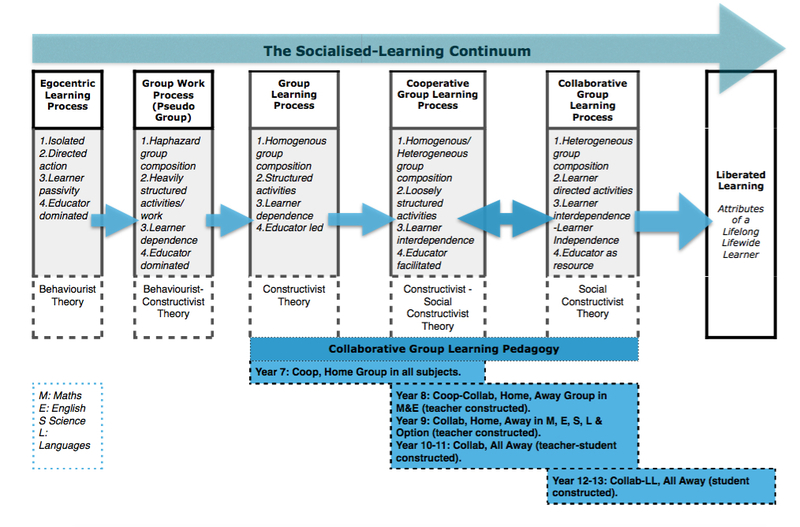 This is a subtle adaptation of my Socialised-Learning Continuum (Version 2), which I discussed in a previous article, now indicating how the move from Group-Cooperative-Collaborative Learning Processes to the ultimate state of Liberated Learning can be mapped against academic years/grades within a school. I believe that at Year 7, on entry to secondary school, the vast majority of learners are at a point within their cognitive and academic development to be able to move from learning through a mere Group Learning Process towards Cooperative Group Learning Processes. A application of a Collaborative Group Learning Pedagogy at this stage support the development of skills, first, for Cooperative Learning and then Collaborative Learning. It is within Years 8, 9 and the GCSE (L2 qualification) years of 10 and 11, that I believe learners and educational establishments are best to facilitate a move through Cooperative and into Collaborative Group Learning Processes, with an emphasis on the later. Once students have developed the skills associated with Cooperative Group Learning, resulting from an application of the principles and pedagogy associated with that phase, the full facilitation of a true Collaborative Group Learning Process can occur. Extended application over 2 to 3 academic years not only has the potential of reaping a range of rewards (as discussed in previous articles) for learners but also prepares them for the next phase and an ideal learning state; Liberated Learning. Once a learner has fully ‘mastered’ Collaborative Group Learning, they, and similarly equipped others can move towards Liberated Learning. I feel that processes and pedagogies associated with Liberated Learning can begin to be applied, for some, within year 11, but one hopes that the majority of learners whom have experienced an education and its associated Collaborative Group Learning Pedagogy for a period of 5 academic years would be able to access Liberated Learning as they enter the next phase of their education; College and A-Level (Level 3) studies. I believe that moving through the Continuum in this manner, applying the principles identified within each distinct process and fostering ever increasing interdependence and independence across, at least, 7 academic years of a child’s education fully prepares them for the next chapter of their life, University level study or the world of work. Skills developed through an application of Collaborative Group Learning have prepared them to be Liberated Learners, learners lifelong and lifewide giving no boundaries as to where this learning takes place, be it in employment or in further academic education. Within this version of the Continuum I have also drawn attention to how I feel, and can only feel as the empirical evidence is still being collated, Learning Sets should be applied in relation to academic stage, phase and subject areas. I have previously written about the Learning Set as a construct, how I believe it should be constructed and its impact but have not yet written about this constructs more fluid nature. I will write separately about the difference between Home and Away groups/Learning Sets and hope to write soon about the optimal use of this facilitating construct within differing subject areas. When first applying the Collaborative Group Learning Pedagogy and the principles associated with its early phases, Group-Cooperative Group Learning Processes, students should experience stability. As such the Learning Set must remain whole and consistently used, both as a physical construct (taking care not to allow the group to physically shatter within or across lessons and subjects) and as a facilitating construct for Cooperative Learning. The group should remind constant and present within every subject the learner experiences within their Year 7 Curriculum. It is these early experiences learners have within a Learning Set that my Doctoral research concerns itself. As learners move into their Year 8 Curriculum opportunities to work with others in newly constructed groups (Away Learning Sets) reap social and academic benefits when applied to Mathematics and English. Teachers would apply the principles first used to construct the original Learning Sets (Home) to the creation of these subject and class specific Away learning Sets. I have found that leaners benefit from continuing to be in their Home set as much as possible and as such it seems only beneficial to apply the Away set to these two core subjects. As learners move more into the Collaborative Group Learning Process increasing the ‘network’ of Away sets seems to have a range of benefits. In Year 9 students may have the opportunity to learn with a fresh set of individuals, heightening their ability to work with others, through Mathematics, English, Science and Languages and, if offered within the school, Optional subjects. By Year 9 a learner may be a member of 5 differing Learning Sets but importantly they still remain a member of the original Home Learning Set. In many schools students make choices about which courses of study to follow as they enter into Year 10 and 11. As a result of every child pursuing their own Curriculum they will find themselves with different students from subject to subject. Here the Away Learning Set is applied as a construct within every subject that student now studies, resulting in the learner belonging to at least 7 Away groups; a sophisticated network of Collaborative Group Learning relationships. The original Home Learning Set persists, now as a pastoral or family unit, something to turn to for guidance out of the classroom and a subject specific domain. Finally as learners move from Collaborative to Liberated Learning, as facilitated within an educational establishment, they will find themselves in solely Away groups and should be made fully responsible for the creation of their own affective-effective Away Learning Sets. This is the beginning of my thinking regards the application of the Socialised-Learning Continuum to educational pathway, drawing together my research findings, the evidence presented by others and the experiences I and others (including leaners themselves) have had of teaching and learning as, with and because of a Learning Set for 3 consecutive academic years. As ever I am keen to discuss this further with all whom are interested. Note: The terminology used is that which is associated with the British Secondary Education System, but of course is transferable to European and the American K academic years/grades or stages.